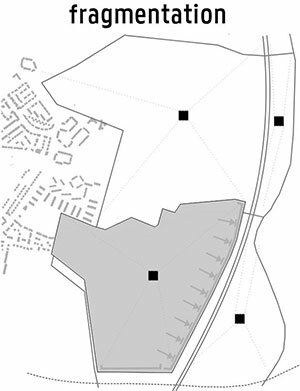 During 2013 we used network analysis on a number of projects including Mapping the Crafts Sector in Southern Ireland as well as in town centre proposals for Leven and Dumbarton which will be written up later. We have also used mathematical formulae on urban design projects to experiment with intensity of use. The 7 Lochs Competition was an opportunity to test these theories-into-practice in a rural/urban fringe context. 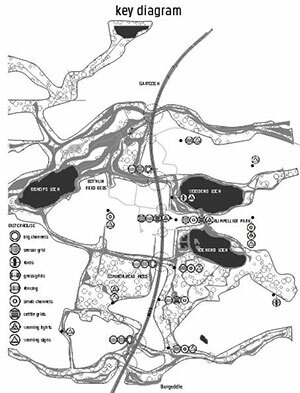 The Gartcosh wetlands corridor, on the outskirts of Glasgow was the subject of a 2013 design competition hosted by the Glasgow Institute of Architects and backed by the Central Scotland Green Network and Glasgow and Clyde Valley Green Network Partnership. 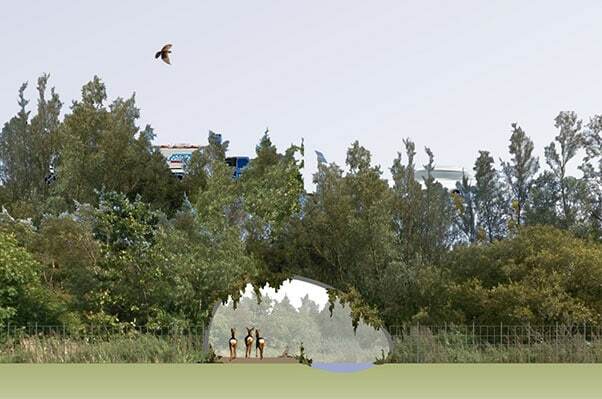 The competition saw 31 submissions for ‘green bridges’ over the M73 motorway that runs through the centre of a corridor which consists of a series of 7 lochs and large tracts of wetlands. Benton Scott-Simmons and WMUD joined forces to initially create a proposal for a green bridge, however the outcome of the proposal, one that was influenced by a thorough analysis of the area and a logical step-by-step approach to remediating the inconsistencies in the corridor, revealed not just a proposal for better connectivity but an algorithm for intervention and a means to look beyond the immediate problem of the motorway. The process and ultimate proposals for the competition are best understood as a logical process, one that starts with a detailed analysis of the wetlands park and that delivers repeatable formulae for intervention, systematically addresses and remediates the problems in that area and that ultimately dictates the types and locations of the green connections in the area that could might be difficult to generate with just beautiful bridge. 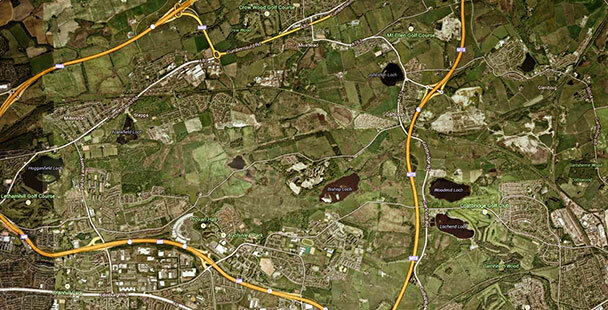 Within the study area, the most obvious hindrance to an otherwise continuously connected green wetland area is the M74, which bisects the wetlands habitat from north to south. The most immediate and uncomplicated answer to this problem is to build some sort of green connection under, over or through the motorway. That is exactly what was addressed by the competition – the most obvious problem. Our team’s analysis revealed that for the same reasons that the M74 disturbs the habitat, so do the other roads that run through the area. These roads, neighbouring communities and the railways all function as barriers to an otherwise naturally continuous habitat. By studying these barriers in more detail, this wetlands corridor can be seen as a series of fragmented habitats rather than one habitat split in two by the motorway. While building an eye-catching bridge over the motorway may seem to rectify this, taking proactive measures to link up the entire wetlands habitat through small interventions may be more worthwhile. Considering that these fragmented habitats are in fact fragmented by objects which hinder natural movements of animals, insects and vegetation, it is clear that the boundaries of the habitats are potentially the most harmful locations in the area and correspondingly, the least harmful places to be are at the centre of the areas. Looking at these fragmented habitats as geometrical shapes, the centroids of these habitats are in theory the safest or least disturbed areas and should be seen as the catalysts for reconciling fragmentation. If the boundaries of the fragmented habitats are the least safe places, that must mean that the intersections of these boundaries are even less welcome in establishing lasting and enduring connections. Therefore, the least harmful place on the barrier boundaries is the midpoint of the geometric edge of these boundaries. 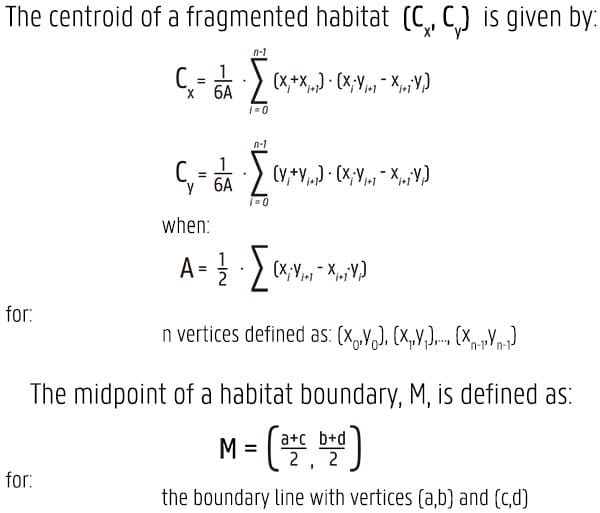 That means, that to connect two habitats together, we must conceptually link centroid to centroid, through the midpoints of the shared boundary. 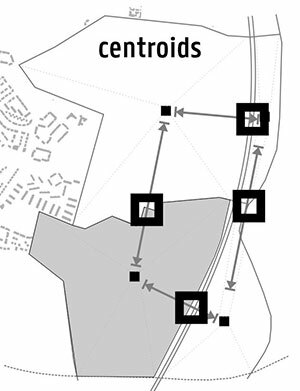 By constructing the series of centroid to centroid connections (via the midpoint of the boundaries) within all the fragmented habitats in the study area, we reveal a network of connections in the area. This network was analysed through an assessment of betweenness centrality, a measure of the degree to which a point is on the path from many places to many other ones. In other words, a node in the network that has a high betweenness measure may be a place that is traversed naturally from many places to many others. A node with low betweenness centrality, although part of the network, may not regularly be a part of normal paths taken in the network. Nodes in our network with high betweenness centrality are therefore conceptually the places that will be the most important in the network and for the promulgation of a continuous wetlands habitat. 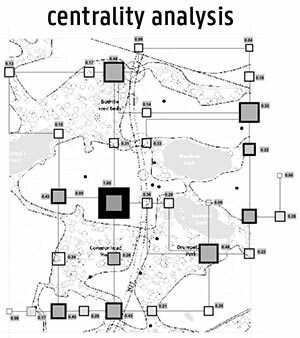 A higher centrality index implies that a larger or more intense intervention will be necessary in order to provide adequate connections from one fragmented habitat to another. The concept is therefore to defragment this habitat and create the interventions at the right scale and intensity at the right place. 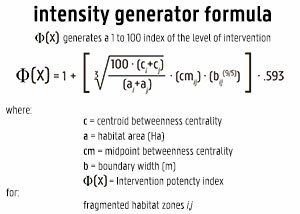 A bespoke mathematical formula was derived expressly for this project, to indicate a number between 1 and 100 that revealed the scale/intensity of the intervention for any given crossing between two fragmented habitats. This includes the crossing at/along the motorway as well as the other habitats in the study area. Before applying this formula to determine the necessary impact and intensity of the various crossings in our network, a study was conducted to determine what types of interventions would be viable and effective. 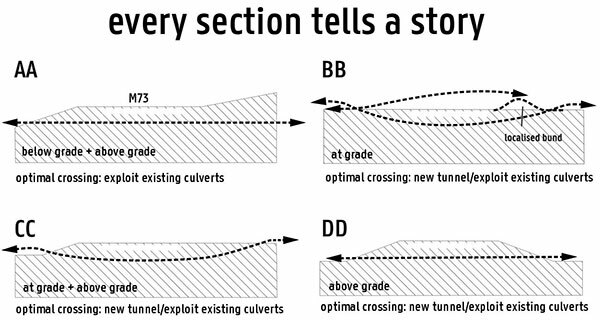 At the motorway, the most destructive boundary in the corridor, a grade and section analysis reveals that there is significantly more potential for green tunnels than green bridges. Because the motorway is built mostly at grade, it would be insensitive and ineffective to try to build over the motorway. Creating connections underneath the motorway is not only more natural for animal, hydrological and vegetation movement, but it is significantly less intrusive and independent corroborate that it would be more enticing for animals to use and easier for them to adjust to. A list of feasible types of interventions was created, both through investigation of generic efforts to create similar connections and through our own studies. 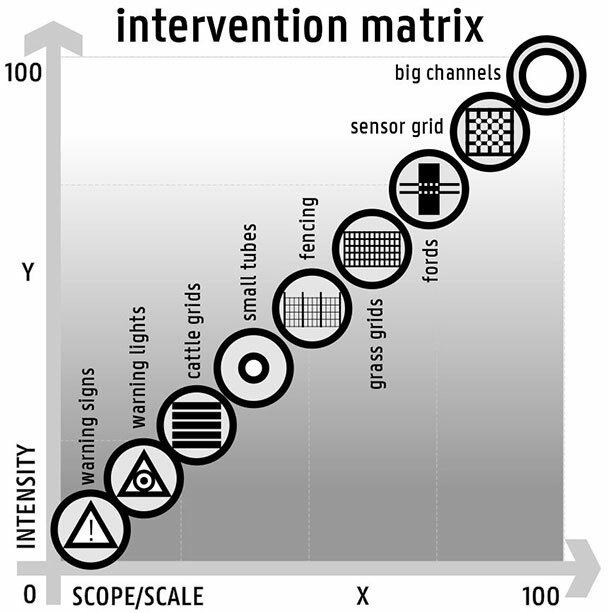 These interventions are arranged according to scope and intensity. After the Intensity Index Generating Formula is applied and each crossing site receives a score between 1 and 100, a suitable intervention is chosen from the matrix. The Key Diagram reveals where functional crossings should be established to defragment the habitat, the types of interventions that are feasible and notably the proposed locations for intervention at the motorway. The primary proposal, for the most significant interventions at the motorway, is dubbed a habitat channel, which should not be viewed as a green connection but rather an habitat continuance, one that creates minimal disturbance and maximum extensions between two otherwise fragmented habitats. By connecting under rather than over, vegetation, water, insects and small animals, in addition to larger animals and birds, can enjoy free and safe movement between habitats that are currently bifurcated by the M74. The easy solution to connectivity problems the 7 Lochs Wetland Park would be to convert one of the existing road bridges into a green bridge but there are numerous difficulties associated with this approach. Firstly, if roads create hazards for wildlife, why encourage wildlife to merge their activities with the normal activities on a road? This implies that a green ‘extension’ of a road bridge would simply encourage wildlife to merge their activities with the traffic in the area creating certain conflict. Even if the current road bridges were made completely ‘green’, what about the remaining road network? The answer is that any effort to retrofit the existing road bridges into green ones only encourages a merger between the natural habitat and the man-made one. Secondly, an elevated road bridge, as numerous studies in other parts of the world have already shown, is not natural and larger animals tend to avoid changing elevations in their normal routes through their habitat. Since the motorway is generally several metres above the surrounding land, a bridge would pose a significant change in elevation. Perhaps through the eyes of the bridge designer this would seem functionally correct it may never be used by animals unless it was very wide and had a very gentle gradient – and consequently a huge land-take of valuable habitat. Thirdly, a green bridge over the motorway could not be used by the entire ecosystem – it would obviously exclude most water based life. The purpose of this intervention is not to build a green bridge but to connect a fragmented habitat and ensure an enduring wetlands park. 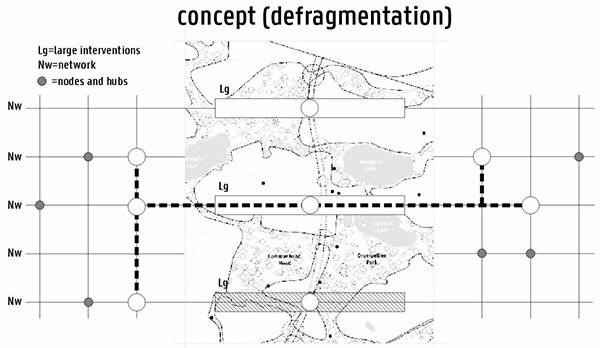 By creating connections under the motorway, we can effectively build continuity into all elements of the wetlands habitat across the motorway from fragmented zone to fragmented zone. The 7 lochs hyper-habitat proposal explained above is a result of an analysis that reveals the necessity of linking together all elements of the Gartcosh wetlands habitat. A green bridge is not the appropriate intervention nor would it even address the entirety of the fragmentation in the area. The 7 lochs hyper-habitat addresses and rectifies all aspects of the ecosystem. We were never going to win the competition with this entry. We did it for a host of other reasons including research, generating new approaches and getting away from the mind-numbing prettification and aestheticization of almost every aspect of current practice. Second place would have been good but it was clear that a pretty picture was always going to win. Not to take away from or discredit the winning submissions nor the hard work of everyone involved and the beautifully produced visuals of the winners but really, a green bridge over the M73 only contributes towards building egos, rather than habitats. The team was Janet Benton, Jacob Dibble, Willie Miller and Ines Triebel.